In this is third part of an in-depth review of 'Dr. No', we focus on the supporting characters, who both help and hinder James Bond. M - In a brief but stunning appearance, Bernard Lee commands the screen as the epitome of just what the perfect M should be. What we don’t know of the character in his speech and demeanor we learn of through the amazing office set from Ken Adam. We spot M’s worldly anxiety signified in the form of the globe standing behind him and the feeling he elicits of a man who must always be on top of dangerous affairs broiling all across the planet. The painting of a ship recalls his Navy past, and the interior office walls of a smooth and rich wood speak to his traditional nature and adds a strength and indescribable “Britishness” to his professional space. It feels like an office Churchill would inhabit while strategizing against the German blitz, visually linking M to a long history of stern leadership. 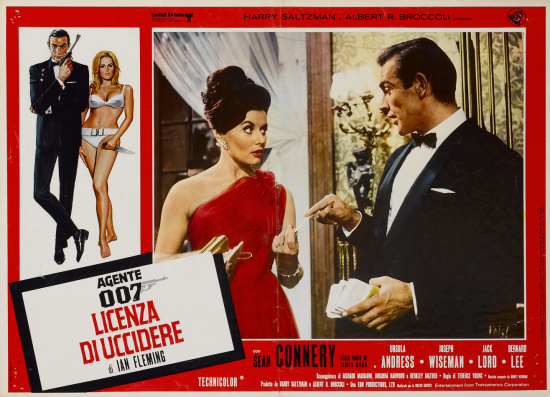 The greatest moments of Lee’s time on screen is when his M scolds Bond for not following his orders regarding the Beretta, then later the hint of annoyance and exhaustion he displays in tone and demeanor as he orders Bond to dispense with the flirtations towards Ms. Moneypenny. The image of Bernard Lee in his debut as the character here, with his hunchback posture and the austere gaze he places on the important files before him perfectly characterize M as a stubborn bulldog with an upper lip so stiff it’d make Churchill himself blush. Moneypenny - As always, Lois Maxwell is a delight, and the chemistry she and Sean carried remains the greatest, as their interactions in their debuts here exemplify. She’s great with Lazenby and Moore, don’t get me wrong, but there’s something so special about the magic that erupted on-screen when she and Sean were in a room together. 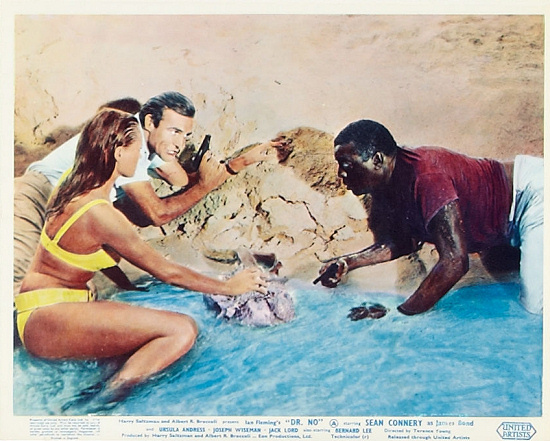 Dr. No is full of some of the greatest moments we’ve seen acted out with these characters. How Sean rests on Moneypenny's office chair, taking her hands in his and dancing with her from that position, humming with charm, and how she attentively accepts his flirtations and pecks of kisses around her face. It’s apparent from the start just how well the two get on, and how much they care for one another. I best relate the interactions between Sean’s Bond and Maxwell’s Moneypenny to two rascals out on the schoolyard, as it reminds me of the fun immaturities kids express to one another when they are playing. When I see Bond pause to make sure Moneypenny is there before he tosses his hat to impress her, it’s not hard to view him as a school kid on the playground trying to get the attention of a popular girl he fancies. Bond and Moneypenny in this film exude a beautiful sense of youthful vigor in their interactions together and from the beginning the significance of these little moments they share during each film becomes clear. When Bond enters her office, which represents the fleeting peace between the outside word of dangerous intrigue and M’s office of reprimand, he feels like a kid again to me, and it’s always lovely to see Lois and Sean play those roles to share a youthful and fun interaction of a quality that only they could create. The care, playful friendship and warmth Sean and Lois exhibit in character to one another never feels artificial, and every time Moneypenny watches Bond leave the office to go off to another mission, you know she’s saying a breathless chain of prayers for Bond’s safety so that they can continue their special ritual of flirtation the next time he comes around again.Quarrel- When it comes time to give out accolades to Bond’s best allies, it’s hard to image an outcome where John Kitzmiller’s Quarrel is left out. Strangways - Strangways is a unique character because we learn more about the other characters who are reacting to his demise than we ever do about the man himself. It’s evident that he’s a good British agent - he is willing to take risks with Crab Key and look into dirty dealings and keeps a consistent check-in with MI6 - but it’s his death that acts as the causation of all the action, suspense, and thrills to come. At the very beginning of the film, Dr. No feels more akin to a mystery than an espionage thriller in part because of Strangways. From the opening titles we are propelled to Jamaica, where we see the peculiar but compelling image of The Three Blind Mice, and we meet Strangways for mere seconds before he’s shot fatally and whisked away. After that point, his death marks the big moment of plot propulsion where the murder victim’s demise triggers the detective (Bond in this case) to come out of the shadows and solve the crime. It could even be argued that Strangways has a greater effect after his death in an off-screen presence than he does whenever he’s on screen. Through his death, we learn of the danger of Dr. No, who at that point is a mystery to us as the viewer. And through Bond’s reaction to the man’s death, we see the first signs of the cinematic Bond’s dutiful nature and the conviction and passion with which he seeks to avenge the murder of his colleagues because he won’t allow a soldier of the realm to be left without justice in death. Quarrel - When it comes time to give out accolades to Bond’s best allies, it’s hard to image an outcome where John Kitzmiller’s Quarrel is left out. Second only to Kerim in the Connery era for me, Quarrel makes for a fascinating and admirable character. The introduction to him is great, as he and Bond rub the wrong way and ultimately end up in a bit of a brawl that could have gone sideways fast. It shows a lot about Quarrel’s character (and Puss Feller’s too) that he holds no ill will against Bond for getting roughed up in the shack, and becomes fast allies with him despite their shared distrust at the beginning. Quarrel proves to be a reliable force of good on Bond’s side, offering his expertise in any way he can, even if it puts his own tail on the line. One of my favorite moments of the film is where Quarrel talks fearfully of the dragon of Crab Key and refuses to take Bond there, but when he sees how much Bond is counting on him, he concedes and honorably volunteers himself, despite that fear. Felix Leiter - Not much to say here about Jack Lord’s Leiter, I’m afraid. He blends in well, too well in some ways, and neither disappoints or adequately impresses. He just kind of exists there, helping Bond where he can. Lord does leave a mark though, in two great scenes at the start of Dr. No. First, we are introduced to him unconsciously as we see him spying on Bond in the airport. It’s hard to tell on first-watch if he’s an enemy or friend, which adds a nice bit of mystery to the story as Bond himself is questioning who to trust after just landing in Jamaica. The second scene, and superior moment, is the image of Bond being held up at gunpoint by Leiter the very first time they meet, which I find cool and interesting. It really clicked hard for me in this viewing how startling it is that the cinematic Bond and Leiter first meet at the very beginning of their partnership (if you treat each era as interconnected canon) with their guns drawn. If Bond or Leiter made a bad move in that shack, the whole moment could’ve turned sour and their friendship never would’ve been jumpstarted. The moment is ripe with tension as we see Bond beaten and forced to hand over his gun, a rare moment of complete surrender on his part. A great relief and feeling of excitement is felt as Bond and Felix realize they are on the same side, and become fast friends. Out of all the Connery era Leiter's, I do feel Lord’s was the one I wanted to see replicated consistently throughout the series. 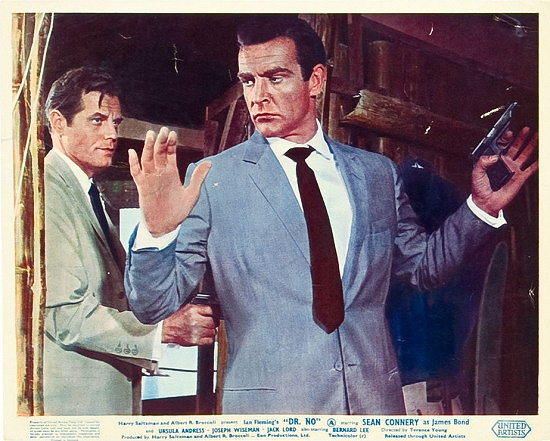 Lord and Connery both looked firm and in command here, like they could really handle the dangers of the job and deal out any of the knocks they took, so it’s very easy to see Leiter and Bond in Dr. No as being doppelgängers of each other, separated only by a “pond,” flag and agency, as it were. Essentially, Lord’s Felix feels like the CIA’s James Bond more than any other Felix we’ve had. Sylvia Trench - A woman with the distinction of being the first Bond girl, Eunice Gayson in body and Nikki van der Zyl in voice brought an allure to Trench visible from the very first moment we see her. She seems to be a well-off gal, willing to bet even more money against Bond in a game of baccarat she’s bound to lose, which shows a great sense of determination and lively spirit. She also slips into Bond’s place easy as can be, so she’s got to be resourceful. In addition, Trench’s main purpose beyond her beauty is to characterize Bond as a hedonist and man of travel. She drives Bond to have a quick shag before heading out to Jamaica, coloring him as the journeyman of the female form, and as we will see through her reappearance in From Russia With Love, Trench will forever represent the kind of woman Bond enjoys for a while at home base before the dangers, intrigue, and excitement of foreign lands pull him away to greater duties and deadlier company on yet another mission. Ms. Taro - I had to make a special mention of one of my all time favorite minor players in the Bond series, brought to life by the exotic beauty of Zena Marshall. Ms. Taro carries a real femme fatale mystique about her in this film, and that works to her favor. Like Honey, she has a beautiful face that masks a certain sense of danger and the propensity for malevolence she can exert when she needs to. The moment where she attempts to put Bond into a trap as he drives to her home is one of my all time favorite sections of any Bond film ever. I adore the look of surprise Ms. Taro displays at seeing Bond alive, knowing The Three Blind Mice must be dead, a look that Bond spots and exploits. 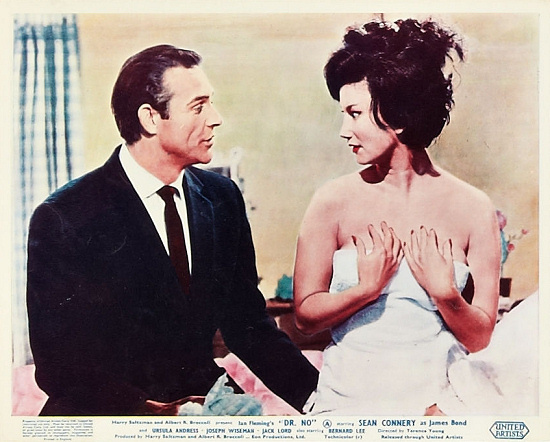 The scene shifts inside her home as Bond clues into the scheme that was laid for him, and gives her hair a forceful, violent tug that masks itself as sexual foreplay. It’s fascinating to watch Bond and Taro both dance with each other here, as we know what game each are playing, and the cards they have in their deck. The bedroom scene that follows after the pair make love is a bit of a veiled verbal chess game between Bond and Taro as they battle for supremacy. She wants to stay put with him in the room to stall so that Dent can come and kill him, while he knows the trap is laid and wants to get out of there. The scene develops with a beautiful chain of small but impressive moments of scheming and mystery that build up between them, ending of course with Bond having the last laugh and tricking Taro into the hands of the Jamaican police. Immaculate. The Three Blind Mice - It’s funny to think that out of the entire history of James Bond, with its gadgets, Bond girls, villains, suits, and cars, it all started with three faux blind hitmen walking down a Jamaican street Abbey Road-style seven years before The Beatles so much as thought of it. One of Fleming’s greatest creations is this trio of trained killers who deflect attention by playing handicapped, which is just a brilliant, brilliant idea. Add to that the fact that they’re driving a hearse when they first appear, and they are symbolically represented as true to form death-dealers. It’s a perfect example of Fleming blending the fantastical with the ordinary in a compelling way, creating a sense of escapism and wonder with this mysterious trio. It’s great fun to see The Three Blind Men trek around Jamaica chasing after Bond, only just brushing shoulders with him until the charming back projection chase sequence that leads to their demise, accompanied by that great one-liner from Bond. Part four will cover the Bondian elements in 'Dr. No'.